Now VCA Nagpur stadium is ready to host India vs Australia 2nd ODI of 5 March 2019. This will be the most crucial match for both the team. VCA Nagpur ticket booking is in high demand due to Australia tour of India in 2019. Australia will be in India to play 5 ODI and 2 T20 matches. India vs Australia Nagpur Tickets price will be announced by the officials few weeks before the match. As of now searches for the India vs Australia Jamtha tickets in high demand and we will update the information of the match. The Vidarbha Cricket Association Stadium is located in Nagpur, Maharashtra, India. The stadium is also known as VCA stadium, Nagpur. Nagpur Cricket Stadium was inaugurated in 2008 and it replaced the Vidarbha Cricket Association Ground becoming the main stadium of the city. The stadium is considered as one of the best stadiums in the country. Many cricketers praised the comfort and the facilities available within the Vidarbha Cricket Association Stadium. It is one of the largest grounds in the world with 85 yards Square Leg boundary and 80 yards straight boundary. The stadium is considered good for the bowlers as it is really hard to hit ball out of the stadium considering its big size. VCA stadium is the home ground of Vidarbha Cricket team and Central Zone team for various domestic tournaments. Nagpur Cricket hosted its first ever test match between 6-10th November, 2008 between India and Australia. The first ever ODI was played on 28th October, 2009 between India and Australia. The Nagpur Cricket Stadium tickets are generally available online as well as offline. The online tickets can be booked by bookmyshow, kyazoonga, ticketgenie website or mobile application by following few simple steps. The steps are elaborated on the websites very clearly. After booking the tickets, home delivery option can also be selected sometimes. The home delivery option is generally available for people living in well connected areas of the country, also for people booking in advance. The foreigner needs to collect the entry pass from the box office location, provided while booking the tickets. The online tickets cannot be used to take entry inside the stadium. To enter the VCA stadium, entry passes should be collected. While collecting the passes from box office, the executive might ask for the card used while doing online payment. The key to have a hassle free experience is to reach early. The last moment rush can make the initial experience unpleasant. So, check the timing of box office in advance. A match of India Australia 5 match of ODI series is scheduled to played at Nagpur cricket stadium. The date is disclosed and tickets will put on sale in few days. Total 5 one day matches are scheduled to play in Australia tour of India 2019 and rest of the will be played at Feroz Shah Kotla stadium, Mohali stadium, Rajiv Gandhi International Stadium and Ranchi JSCA International Stadium. One day international match of India vs Australia 5 ODI match series is scheduled to be played here. The dates are announced by the officials. Australian cricket team will visit the India from February 2019 to March 2019 to play 5 ODI and 2 T20 matches. The match is expected to be a high voltage match as it will be played between India and Australia after a long time on in the Nagpur Cricket Stadium. The tickets for this match can be booked by online or offline modes. Tickets are expected to sold on insider one week prior to the match. VCA Nagpur Stadium ticket prices will be announced soon . 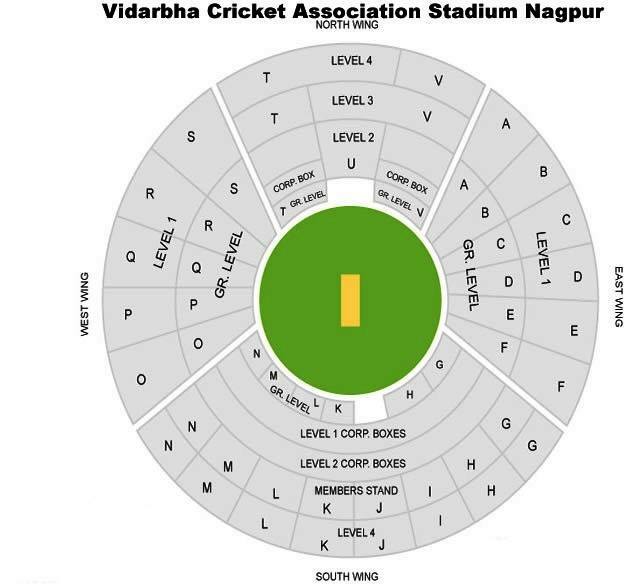 VCA Stadium Nagpur ticket price might be starts at 750 Rs and goes upto 1500 Rs. Starting ticket price expected to affordable to the pocket and these denomination tickets will sold early. Ticket booking will started through insider website and app. Home delivery of match tickets might also available on selected pin codes. Nagpur stadium online tickets are not valid for entry inside the stadium. These E tickets must be exchanged from original entry pass to get enter VCA Jamtha Stadium. Ticket rates of Nagpur Stadium India Australia one day international match are expected on the higher side. This time GST might also be implemented on the tickets, so that ticket prices will go up. The ticket prices might start from 750 to goes up to 13000. First ODI of the series is scheduled at Hyderabad Stadium. Nagpur cricket is also known as VCA stadium. Google location Map of stadium is showing the exact location of the stadium along with nearby roads, highways and locality. Seating map is showing the seating arrangements of the stadium along with pitch and all the wings. Corporate boxes, levels, pavilions, stands are clearly depicted on the layout. The Nagpur Cricket Stadium is one of the best stadiums in the country. The infrastructure and the ground ensure that you have an overall pleasant experience. After collecting the entry passes from box office, check the gate number printed on the back. The given gate is for the used to entry in the stadium stand. There are few rules and restrictions on the items carried inside the stadium, in order to avoid any miss happening or obstruction in the match. There are a number of items which are restricted inside the stadium. It is advised to avoid carrying unnecessary items in the stadium apart from mobile and wallet. The list of restricted items includes: Coins, metal object, binoculars, earphones, power bank, cables, cameras, bottles, eatables, drinkable, plastic bags, etc. Some of the allowed items are baby Diapers, baby food, medicines. If any of the restricted items is detained at the security gates, there are very low chances of getting that back on the way back. The stadium gates open around 3 hours before that start of the match. To avoid the last moment rush and traffic, it is suggested to reach Vidarbha Cricket Association stadium early. The Nagpur Cricket Stadium has very big ground and it is appreciated by many international cricketers and commentators. The VCA stadium Nagpur has very comfortable changing rooms. The journalists and commentators had praised the commentator’s box and press box a number of times. All basic facilities are also in place for the spectators. The cafeteria serves good food which and it has good variety too. The chaired arena is well covered by the roofs saving spectators from bad weather conditions. There are ample amount of washrooms available inside the Vidarbha Cricket Stadium keeping in mind the convenience of spectators. The ground has a big parking space, but it is suggested to use public transport. The traffic jam at start and end of the match can really be headache sometimes, so using cabs or buses is better. I have booked the tickets ..but the question is how to collect tickets… will it be home delivered ? And how many days Will it take? hellow dear, could you tell me how to find offcial link to purchase cricket match ticket which is held on nagpur on dated 1 oct 2017?